Please consider making Your Sacrificial-Gift to support our St. Cecilia Parish’s Capital Campaign to build our newly Pastoral Center building. We are deeply grateful for your generosity and loving support throughout the year and in particular Your-Sacrificial-Gift. Please be assured that we send the tax deductible letter to you toward the end of January 2019. Please do not hesitate to contact Deacon Bill Weeks, our Business Manager, at 714-544-3250, Ext. 12, or Fr. Bao Thai at 714-544-3250, Ext. 14. 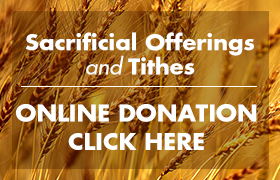 Thank you for your charitable and sacrificial giving! May God bless you abundantly!